Over 100 Chinese and Bulgarian companies took part in the Bulgarian – Chinese Business Forum in Plovdiv. From the Chinese side was attended by representatives of companies from Ningbo city areas. Companies representing: light industry, real estate, tourism, construction, recycling and the environment and many others. Bulgarian business was presented by companies from different sectors of the economy. During business meetings it became clear that Chinese investors are interested in potential projects. They are looking not only for industrial parks, but for vacant land which can be developed for production activities or to build logistics centers. During the business meeting the representatives of Chinese business defined Plovdiv as an attractive destination for their investments. In practice, the city could become the capital of Chinese business in Bulgaria. 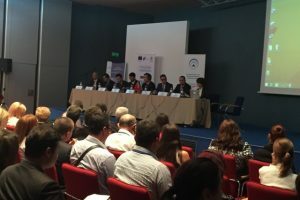 Traditionally good contacts and developed business forum was declared with the start of the Euro – Chinese Economic Development Zone in Thrace economic zone. The interest of Chinese investors is confirmed by the growth in bilateral relations. 771 million. euro trade between the two countries in 2014., which is a 14% increase over the previous year. Plovdiv emerged as the most attractive zone for investment in Bulgaria including development of industrial parks and concentration of the industry leading exporting companies. In Plovdiv are situated the country’s largest logistics centers and industrial parks. Plovdiv region has an excellent transport infrastructure – highways, railways and modernized international airport, which facilitates the process of industrialization of the region. In recent years, due to its strategic location Plovdiv has become a preferred location for foreign investors. Bulgarian – Chinese business forum was organized by the Executive Agency for Promotion of Small and Medium Enterprises in cooperation with the Municipality of Plovdiv and the Bulgarian-Chinese Association for Business Development / BKABR /.